Could it be? 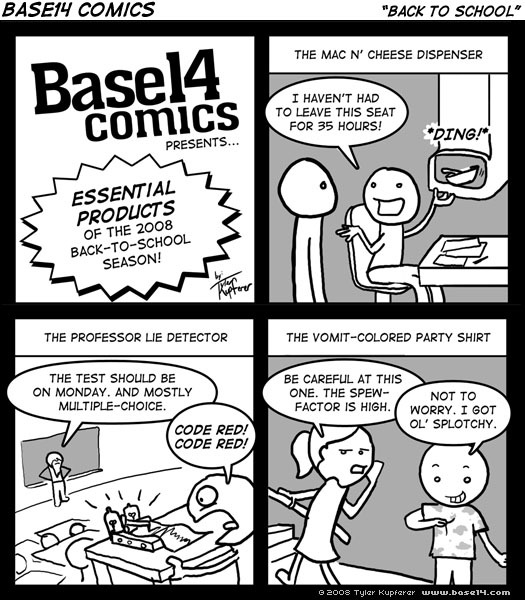 The triumphant return of Base14 Comics? Well, it was supposed to be. Three weeks ago. Now that I’m a grad student happily nestled in Savannah, the plan was to begin publishing a weekly comic in the student newspaper, The District. But the comic was pushed back from the first issue to the second, then to the third, and now I’ve gotten word that this week will be the last printed edition of The District ever. Looks like this syndicated strip got canceled before it ever got published! Ah well. Below is the one and only strip of Base14 Comics that was meant for The District, but didn’t make it out. Naturally, it’s meant for a bit earlier release than the end of September. Why not publish your strip in the paper’s online edition? Very nice! You didn’t tell me the paper got canceled! That stinks.